The truth is that hundreds of thousands of dollars has been awarded to tenants who avail themselves of the rent control laws of their municipality. In Hoboken one particular lawyer has single handedly had the rent control ordinance in Hoboken reinterpreted over the years to make the rent control laws one of the most effective legal transfers of wealth from the land owner to the tenant that New Jersey has ever witnessed. You can argue that the rent control law is bad or good, but not its brutal effectiveness. It is one of the only civil laws I know that allows the winner of a lawsuit to immediately collect on the judgment. This is because if it is determined by the rent control board that a tenant has been overcharged then the Tenant can immediately stop paying monthly rent by offsetting amount the Landlord owes the Tenant with the rent payment owed every month to the Tenant. By representing both Landlords and Tenants I know the tricks and loopholes, strengths and weaknesses of both sides of the law and that experience will be shared with you if you retain my firm. 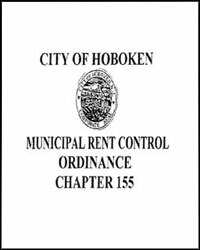 Hoboken Rent Control Ordinance: 155-4 Controls; increase restrictions. All rents for rental of housing space and services in dwellings to which this act is applicable are hereby controlled at the base rent level received by the landlord as of January 11, 1973, and no rent increase shall be hereinafter demanded, paid, or accepted, except as provided in this chapter. Any rent increases imposed after January 11, 1973, the date of expiration of federal rent control, to the extent that such increase(s) is in excess of that to which this is an amendment, are hereby declared to be null and void, and such excess rent shall be refunded or credited by the landlord forthwith. All rents may be rounded up or down to the nearest dollar after making the computations. Landlords shall report all increases of rents imposed after January 11, 1973 to the Rent Leveling and Stabilization Board. Any landlord seeking an increase shall notify the tenant in writing at least thirty (30) days prior to the effective date of the increase and explain in detail the reasons for the increase. Determinations under this section shall be made by the Rent Regulation Officer. To set up a consultation concerning any rent control matter, contact us online or call us at (201) 656-1000.